Disposable, single-use plastic is starting to get the bad rap it deserves. We’re beginning to come out of the fog of “convenient” and “cheap” to notice the resulting damage it is doing to our environment. Look, I get it, some call plastic a “miracle” and I’ll admit that there are plenty of applications where it’s been an incredible game changer. But, in the case of a single-use items that will endure for some hundreds or thousands of years in a landfill or floating in our oceans, that’s no miracle, that’s a design flaw. But wait! It’s almost all good news from here! We’ve got a perfectly simple way to start our journey away from single-use plastics. Join Sustainable Seacoast as a member (with benefits) of a group speaking up and supporting restaurants committed to eliminating single-use plastics. With your help, we will continue to sign on new restaurants and work to help them begin and continue their transition away from single-use plastics and improving their sustainability. Trust that our small intentional actions can have lasting positive results, and we will leave the planet in better shape for future generations – that’s what Sustainable Seacoast is all about. We need your help, and it starts with becoming a member, we’ve launched a crowdfunding campaign with a bunch of cool perks and that’s where I’d like you to go right now! Thanks for hearing me out, and thanks for helping us lead the way here on the Seacoast! 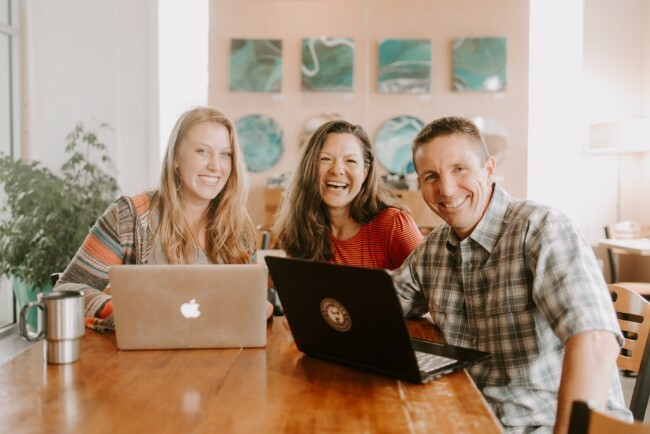 Featured photo: Bee Gleason, Kate Harris and Keith Tharp want you to join Sustainable Seacoast to get single use plastics out of the Seacoast’s restaurants!